At the heart of it though, everyone is on an equal playing field in my eyes and everyone who cooks is someone I can learn from. I feel like a young child learning a new language when it comes to food, a little sponge soaking in all that’s new with every new dish I am introduced to. I just get so giddy when I eat something for the first time, visit a new restaurant or (and what I treasure most) when someone cooks for me. I am also lucky to have married a wonderful Polish man who I moved to Mexico with. Here, I have been sharing two culinary worlds…Mexican & Polish. Living in Mexico for the past two years has introduced me to the vibrant flavors of latin cuisine and I continue to learn about foreign ingredients and how they are used (pretty much eating my way through Mexico). Additionally, being married to a Polish husband came a Polish grandmother and boy can she cook! Through his grandmother’s food I feel adopted, embraced and loved as if I were blood. She has introduced the Polish steadfast traditions and has taught me a few tricks (though what I find equally amazing and adorable is she asks me for “tips” and “recipes”). In my eyes she is like Julia Childs. Regardless of where I came from and who I am now, let’s just say I have “many grandmothers”. Which brings me to my next point and my recent trip to Poland….Happiness can be found in food regardless of where you live and where you come from. Poland has withstood the test of time and the country has survived at many times a very cold and dark past, yet food and much of its cultural wealth has been preserved (and certainly that can be attributed to the “many grandmothers” that live there). Even with these traditions Poland has also adopted many new ones. After the fall of communism there has been a mass influx of Western Culture. You can find among the streets of old Krakow sushi restaurants, Thai cuisine, pizza places and more. I however, with my first visit to Poland, was determined to find the heart of Polish cuisine and let’s just say no restaurant was able to do that. Where might you ask can you find the best pierogi or żurek soup? At home. Home amongst family and loved ones and those with everything and those with little. During my visit I was introduced to my husband’s family and their delicious food. From city life to country living his family runs the gamete. We stayed with my husband’s delightful aunt and uncle and every morning we had a traditional Polish breakfast. The standards: hard boiled eggs, cheese, sausage and sometimes a pasty or two with hot tea (though his aunt comically mentioned she does not normally eat like this….granola and milk are staples as they are in an American household). We visited other family out in ski country where we ate traditional Polish apple pie, pierogi and some of the best żurek soup I have ever had (it had white sausage). I also fell in love with this place as his uncle and his wife were helping run a B&B. Oh the day dreams of running something like this and serving great homemade food! However, the highlight of my trip was a special visit to the tiny village of Prazka. My husband’s cousin is married to a woman who’s family still lives in the typical communist block of flats, though these buildings have since been painted bright colors similar to those you see in Mexico. The hospitality and generosity of this family was amazing. They even planned a special trip for me to visit a local sausage maker. We feasted that afternoon as if we were kings! I will never forget my first visit to Poland and I hope to go back soon. As I mentioned, I am so lucky and with each bite my perspective changes. Here is my adaptation of pierogi….my way but with many influences and many grandmothers. For the dough; Mix the flour and boiling water together in a medium bowl. In a small bowl, mix the melted butter and egg. Season the mixture with salt and pepper. Mix all ingredients and knead on floured surface until dough is gathered into a ball. Set aside at room temperature if you plan on making pierogi right away. Dough can be frozen as well for later use. For the dried morels; in a heatproof bowl, soak morels in boiling water for about 20 minutes. Strain the morel soaking liquid and save if for adding extra flavor to soups or stews (I froze mine for a later date). Finely chop the re-hydrated morels and set aside. Cook the potatoes in a large pot of boiling, salted water until tender (easily pierced with a fork). Strain and drain potatoes and in a large bowl mash with a potato masher. Mash in the warm milk, sour cream, cheese & butter. Stir in the morels and season with salt & pepper (LOTS of pepper if you are going to the “traditional” bite pierogi have) and let cool. Note: to make this mixture extra creamy, put it through the food processor. Working the dough in batches, take enough dough out on a floured surface and roll out to about 1/16 inch thickness. Take a 4-inch biscuit cutter and stamp out as many rounds as possible. Dollop about 1 Tbsp of potato filling onto each round, filling half of the round. Pat the filling down slightly and fold the other of half of the round over the filling, creating a half moon. With a fork or fingers and pinch the edges to seal. Set aside on a floured platter and repeat with the rest of dough & filling. Note: dough can be frozen so you do not have to work the full batch and potato filling keeps for several days. Or if you make the whole batch you can also freeze before cooking for up to 1 month. To cook the pierogi, bring a pot of salted water to a boil. Cook in batches. Pierogi are cooked once they rise to the surface (approximately 1 min). With slotted spoon, transfer the pierogi to paper towel and dry. Cook bacon until crisp and drain bacon of fat on paper towel, reserve the oil. Using the bacon oil sweat the onions and cook until caramelized. Keep warm to garnish pierogi. Light a grill or grill pan. Grill pierogi over hot flame turning once, until browned with grill marks (approximately 3 min each side). 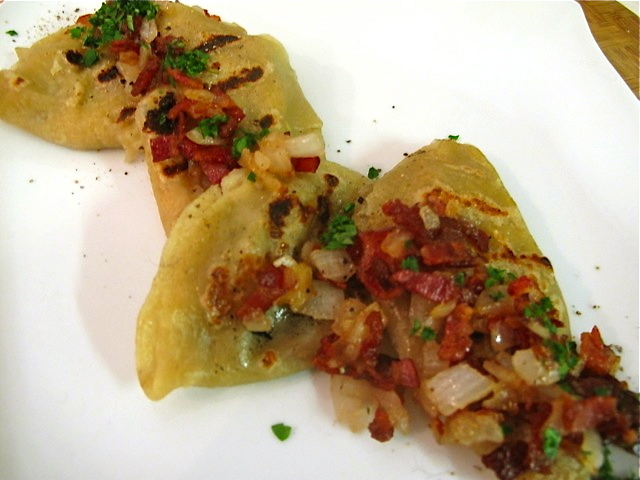 Transfer pierogi to platter and garnish with bacon bits, onion and parsley.